Discussion in 'Pedal Effects Gear Emporium Archive' started by ChampReverb, Dec 6, 2016. USA lower 48 sales only. Prices include USPS shipping. I will send you the USPS tracking number when the pedal ships. From a clean, pet-hair-free, smoke-free home. Great pedals, used very lightly, but just not the flavors I'm looking for right now. 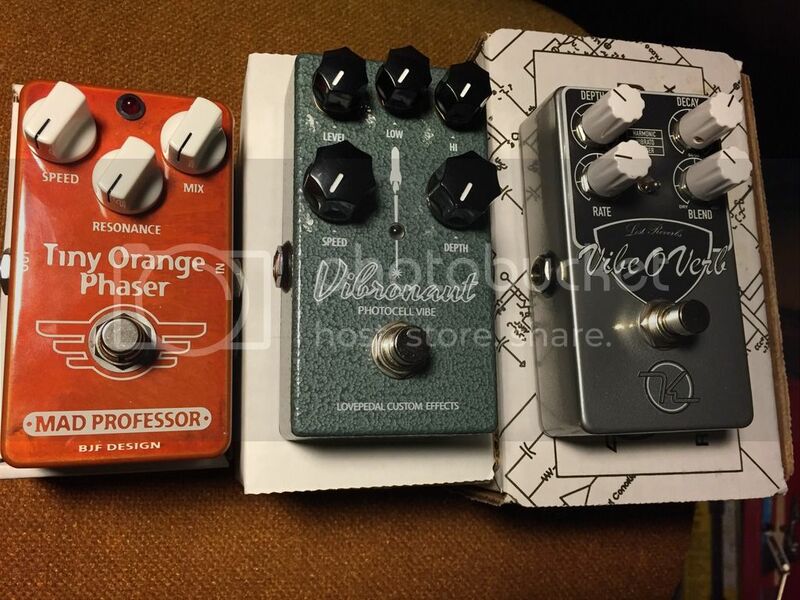 Mad Professor Tiny Orange Phaser (HW) -> $199 -> SOLD! Lovepedal Vibronaut (5 Knob) -> $179 -> SOLD! Great vibe, just don't use it often enough to keep it. Keeley VibeOverb (Modulated Reverbs) -> $99 -> SOLD! Timmy v2 ** Ramble Fx Twin Bender v3 ** Drybell Vibe Machine v2 (2016) ** Strymon El Capistan v2 ** Lumpy's Brilliance Boost (2015 version) ** Lumpy's Jelly Roll (2011-ish) ** ** Rockett Blue Note ** Or...?? ?